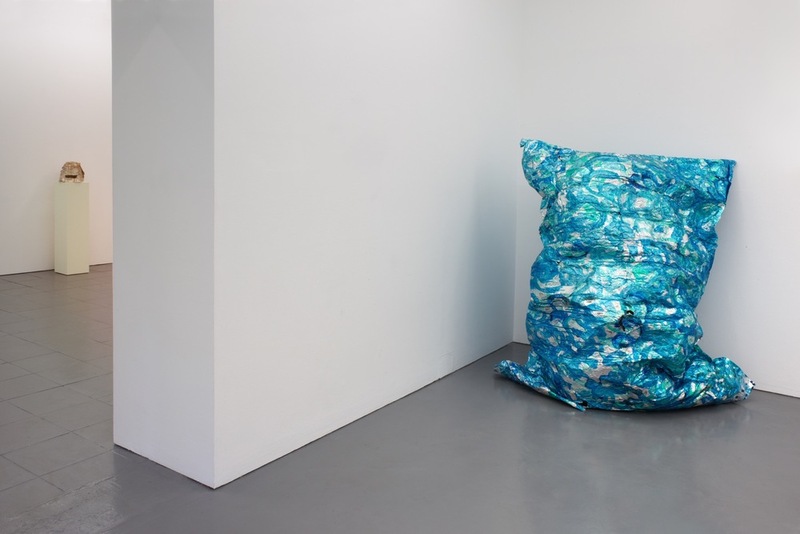 Caroline Achaintre, Sarah Bowker-Jones and George Young have distinct and divergent approaches to material and process. For this exhibition, all three have produced new work and have been engaged in the selection and installation as well as the titling of the show. This collective engagement has revealed a number of common interests, particularly a shared inquisitiveness about image and object making through the languages of sculpture and painting. In Jumpy Recline Sarah Bowker-Jones has reconfigured remnants of existing works alongside newly made elements to create a site-responsive work for one of PEER’s window spaces. Like the method of bolting together Meccano plates, the jesmonite panels she constructs can be reconfigured and assembled as an adaptable system for the site of exhibition. Forms that break down or structures that collapse, dissolve or degrade are never intended as finished, polished sculptures but are constantly in flux ready to be reinvented. Anthropomorphic forms recur throughout Caroline Achaintre’s work with ceramic sculptures that bear crude facial expressions or grimaces and begin from an interest in the surface of manufactured materials or textiles that are imprinted into the clay. Prophet and its companion Peres demonstrate Achaintre’s interest in the ambiguity of materials, where combinations of the fixed clay and malleable leather or textiles co-exist. A new tufted wool work has been created for this exhibition; a mechanical and fast process, which, results in large-scale wall hangings that hold a shamanistic authority over the space they occupy. Without prescribed beginnings, their means of production share more with action painting than with the language and precision of tapestry. George Young describes the manner with which he uses materials as ‘wrong-footings’ or ‘impersonations’ that superficially seem to have other physical properties. His sculptural work at PEER cross references one element of a stolen Barbara Hepworth sculpture, Two Forms (Divided Circle) (1960), that creates a deception of surface and weight through its reincarnation in polystyrene. Cultural frames of reference also appear in his paintings, spanning British Modernism to Paparazzi photographs. Made on paper and often shown alongside sculptural stretcher-like frames, they are installed as part of an interrogation or deconstruction of the materials of painting.